Is it ethical to have pets outdoors? I remembered lately that our feral/semi wild cats always outlive our pet cats. We have one feral cat that hasn't been touched in well over a decade when he attacked the vet (we had to trap him first ). I guess he is about 15 years old and arrives morning and evening for his food, and then disappears out of sight. He comes from a line of semi wild cats, and is quite inbred, he rarely travels on the roads, nearly always opting for the fields, his sister had the same disposition, she was ill for quite some time before she disappeared one night presumably to find a safe place to pass on. Our pet cats have all been run over by cars, I am thinking that their limbic system is less developed as a result of domestication, their fight/flight response is handicapped. Yet, a cat still has instincts that they will follow, do you keep them safely indoors at all times, and limit their desire to roam, to be a cat, or let them out, knowing they are impaired and run the risk of an untimely end? My cat is an indoors cat. She was quite ill when I got her so she spent a long time indoors, recuperating. I do take her for walks on a leash daily and put her on a long lead so she can have freedom to explore the garden and get some sunshine. I also have a 'share cat' with the neighbour. A stray that we adopted. It's an outdoors cat and not very friendly at all. The one I had before the one I have now was an outdoors cat and she lived for a long time, but again, she was not overly friendly. The big difference I've noticed with the one I have now is that she's very affectionate and seems to enjoy being part of everything that's going on in the family. Despite the fact that they may be hit by a car, I think it's more unethical to keep a cat locked indoors for its whole life. If someone lives on a busy road where it's highly likely that they might get hit, maybe they shouldn't own cats. Common sense. At the same time, you can live in a quiet area surrounded by fields, but they still might wander into a road. Some cats are wise to it, some aren't. My family has had cats which have lived to a ripe old age, always being wary of the roads. But we've also had cats die before their second or third birthdays because they got hit. Diagnosed Aspergers, Dysthymia and Borderline Personality Disorder. + Empathizing Quotient is 7. Below average understanding of how other people feel. + Systemizing Quotient is 56. Above average ability for analysing and exploring systems. + Ritvo Test: Higher than the average male with ASD (My Score 206.0; Average: 148.6). Pay me for my signature. 私の署名ですか❓お前の買うなければなりません。Mon autographe nécessite un paiement. Которые хочет мою автографу, у тебя нужно есть деньги сюда. Bezahlst du mich, wenn du meine Unterschrift wollen. I've always had indoor cats that came and go outside, it's impossible to keep them inside forever and once they get out once they usually want to go out again. They are well adapted to living around people and urban enviroments, I certainly see plenty around the neighborhood. I've lived out in the country too, they love it. There more anti-social barn cats too that only really come inside to eat(and s**t which is really annoying, why can't they do that outside?) and they seem more often to get sick or hurt somehow. My girlfriend's cat has always been a strictly indoors cat. The cat my girlfriend had before was an outdoors cat till she disappeared for months. She came back looking in bad shape so my girlfriend thinks that she had gotten trapped somewhere. She became in inside cat after that. Waldo stays in at all times. I switched him to an all meat diet (which he's allergic to whatever is in dry food and used to vomit a lot). I get a lot of my ideas from "My Cat From Hell" and Cat Daddy. I found this on Petfinder. I love that you walk your cat! Does it ever look like this? Ban Dodger, what do you think of a minced beef with rice and (some) vegetables diet? I noticed that the outdoor cat was regularly injured from fights especially in his younger years, but he always healed and recovered. She became in inside cat after that. I would like to have an indoors cat, but its just not possible right now. Thanks that's a good link. We buy a "natural", "organic" high quality cat food. On the recommendation of people on another forum, I gave some to the feeder crickets we keep for my oldest child's Beardie. The next morning, half were dead. I started researching the ingredients and the entire middle block although technically being natural or organic were actually all pesticides. Over a third of the ingredients list. So a caveat, always do research when buying commercial, processed food for you or your pets! Last edited by Edenthiel on 28 May 2016, 5:47 pm, edited 1 time in total. I would consider it safer than the typical pet-food sold out on the commercial-markets. I like this guy's recipe and I think that even cats can eat this recipe as well..
Also have Life's Abundance products that I obtained to feed the cats around here (including ferals). Here we conduct a systematic review and quantitatively estimate mortality caused by cats in the United States. We estimate that free-ranging domestic cats kill 1.3–4.0 billion birds and 6.3–22.3 billion mammals annually. Un-owned cats, as opposed to owned pets, cause the majority of this mortality. Our findings suggest that free-ranging cats cause substantially greater wildlife mortality than previously thought and are likely the single greatest source of anthropogenic mortality for US birds and mammals. Scientifically sound conservation and policy intervention is needed to reduce this impact. In other words, if we didn't let our cats out, there would be a *lot* more birds and other small creatures around. While no longer perfectly adapted to the wild, they are still incredibly efficient, highly driven hunters who will kill even when not hungry. I'm sick of people guilt-mongering me for not letting my cats outside, or actually buying them store made food. They are each about 8-9 years old now, and are healthy and content. I had them spayed, neutered and vaccinated so don't tell me I'm a bad cat owner. It's bad enough when "helpful" people give a mother their unsolicited advice on like how letting her kids watch a non-educational program will be the reason they rob a convenience store when they're 17. 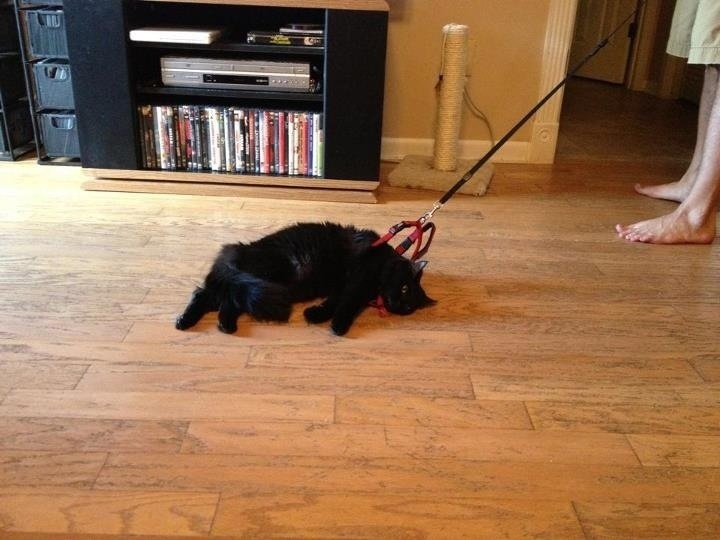 My girlfriend tried putting her cat on a leash before but she just attacked/played with the leash so she couldn't actually be walked. If it is a pet and not livestock or working dog in security or herding , then it should have the maximum of socializing and the safety of indoors for smaller sized animals. And large body of time with it's family which often entails indoor time. Larger animals in a safe contained yard/paddock is good fr them to have good free movement at will, though parasites and other people loose animals could be a problem. There is no leash law where I am presently nor any vaccine but rabies required. Therefore our donated shepherd is indoors though I hate having her crowded up in my room. Of itself outdoor does not mean unethical but quickly becomes so because the outdoor pet is easier to forget in terms of health care, socializing and exposure to harm by parasites, loose animals and unexpected weather. Most non cat outdoor animals are caged small or chained. Plus being a good neighbor. Not ethical to have your pet outdoors loose in places it can cross property lines. You will be horrified when Rob the redneck hauls your cat to the pound or to a lake or buys a cat hating dog and sets it on her, but when Fluffy has scratched the hood of his new truck that he overreached to acquire, crapped in Bob Junior's sand box and killed all the hummingbirds Arlene had lured there with a feeder.... where were you? When your loose dog has damaged someones smaller dog after jumping a fence or grabbing it as it was on a lead, where were you? If your loose cat causes someone to swerve and have accident instead of using her for speed bumps..where are you? That is when the ethics starts. Plus in my own opinion, if you love your pet, you will know where it is pretty much all day. You will have prevented it from harm and from harming if it is contained and especially if indoors. the 2d most memorable was a loose badly trained shepherd mauling and killing my treasured 4 year old cat in front of me a week after it and 2 others had jumped the back fence and killed my rabbit. The dog also injured my coyote hibrid that broke my bedroom window to attack him when he came at me. My cat had followed me to mailbox. And the following day my mother took a riot gun (for the people to stay shut up) and a 45 for the same dog across the street and shot their vicious child biting cat killer in the head. I was eight. A lot of drama. 4th worse: And my daughter was terrified for years of winds after a coyote pack literally quartered a little lhasa apso looking dog under our bedroom window one night. 3rd worse And then my youngest son's first dog a pit mix, was mortally injured when a larger loose pit came on the porch and grabbed my then 2 yr old while I was mowing the yard and mom was getting him a drink , door open. His cat also came out and attacked the strange dog. Our neighbor chased and hit it with his car then shot it. His brave cat was lost when the babysitter made it an outdoor cat while we were out of town for 2 weeks before move. Dogs being larger and loose is bad. Cats are loose by default if outdoors alone. And they ARE a nuisance. I probably will not have a cat again. I do not want to deal with litter box duty unless the cat has its very own bathroom. I no longer have patience to toilet train one. I won't have one outdoors since I normally live in areas with birds of prey, coyotes, feral dogs and javelina. May as well just throw the kitten on the freeway before I get attached. Or best, never pick one up on impulse. My last cat ever was one persian I bred that was returned when owner died in 2009. He was loose (without permission) and ended up killing himself on a parked car because a dog on chain lunged at him an he ran into tire, poor ol thing. He was 17. I suspect my cat may be part dog. She walks very well on a leash. When I was a kid, the old lady who lived at the back of us used to tie an empty milk bottle to a long rope and attach it to her cat's collar. When it jumped over the fence, the milk bottle would get caught in the pickets on the fence and the old lady would go and reel it back over the fence again like a fish on a line. But the cat soon learned not to jump the fence.